Located in the Guadalupe Mountains of New Mexico, Carlsbad Caverns National Park is named for its impressive network of caves, which are the seventh-longest in the world. American Indians and early settlers knew about them, but aside from guano harvesting, the caves garnered little interest until a 16-year-old ranch hand dared to venture deeper into their depths. What he found was far more exciting than fertilizer. 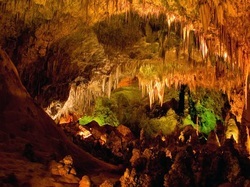 The wildly decorated caverns astonished local tourists, and before long attracted the interest of government officials. Carlsbad Caverns would be declared a national monument in 1923, and a national park seven years later. Since then, millions of people have descended deep into the underground labyrinth, a complex natural maze where new discoveries are still being made. Since 1986, more than 110 miles of new passageways have been mapped in Lechuguilla Cave, a remote cavern in the park’s backcountry. Scientists are researching the potential health benefits to humans of certain microbes that live deep in the cave’s pristine environment. But even if you choose not to visit the caves, there’s a lot to do at Carlsbad. The park protects more than 33,000 acres of Chihuahuan Desert wilderness, which is open to hikers. Wildlife watchers will delight at the park’s impressive bat outflights, which are supplemented by ranger talks. Click to see a detailed Carlsbad Caverns National Park map.